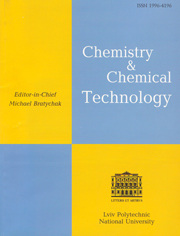 Research of the influence of oxygen and nitrogen containing organic additives to the catalyst on the main parameters of the process of cyclohexane oxidation have been conducted. A wide range of nitrogen and oxygen containing compounds and compounds based on polyglycols with varying molecular weight have been used as additives. The obtained results have been analyzed in view of the structural features of the studied additives and the probability of their interaction with the catalyst and intermediate products of oxidation with subsequent formation of intermediate complexes or associates. Vikram G. and Suresh A.: Ind. Eng. Chem. Res., 2007, 46, 6891. Suresh A., Sridhar T. and Potter O.: AIChE J., 1990, 36, 137. Raja R. and Thomas J.: Mol. Catal. A, 2002, 181, 3. Yuan H.-X., Xia Q.-H., Zhan H.-J. et al. : Appl. Catal. A, 2006, 304, 178. Shylesh S., Prinson P. and Singh A.: Appl. Catal. A, 2007, 318, 128. Li J., Shi Y., Xu L. and Guanzhong L.: Ind. Eng. Chem. Res., 2010, 49, 5392. Loncarevic D., Krstic J., Dostanic J. et al. : Chem. Eng. J., 2010, 157, 181. Chavan S., Srinivas D. and Ratnasamy P.: J. Catal., 2002, 212, 39. Ivashchuk O., Mudryy S., Mel’nyk Ju. and Reutskyy V..: Voprosy Khim. i Khim. Techn., 2008, 1, 63. Costantini M. and Fache E.: Pat. US006147256, Publ. Nov. 14, 2000. Luque R., Badamali S., Clark J. et al. : Appl. Catal. A, 2008, 341, 154. Jevtic R., Ramachandran P. and Dudukovic M.: Chem. Eng. Res. Design, 2010, 88, 255.